Our Land Publications – 5 American History & Geography Sets www.ourlandpublications.com Periodical History & Geography Studies of 4 major states and one overview of the U.S. By Joseph Grayhaim Homeschooling families tend to value truth and accuracy in the curricula and materials they use. Political correctness, subjective judgments and other intrusions and distortions of fact are typically not welcome in the homeschooling environment – the avoidance of such obstacles to understanding is what makes many families opt for homeschooling to begin with. Our Land Publications offers five periodic sets for the study of history and geography, four of them centering upon a state: California, Texas, Illinois and Indiana plus an overview of United States history, Our Land of Liberty, for Grades 5-9. The homeschooling family can utilize a set as the core curriculum study or as a supplement to another book – especially in areas where certain textbooks are required for use. 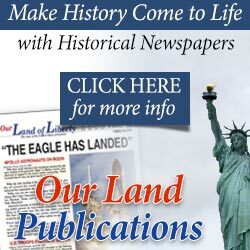 Our Land of Liberty contains 33 chronological issues in the form of small newspapers,presenting the history of the United States in a student-friendly, informal style that is alive and interesting. Imagine if you found some old newspapers in your grandmother’s attic. You would read about past events as living and potentially life-changing experiences that shaped our current world. The lives and actions of people in grandma’s time come to life, as they were today. Our Land of Libertyis written with our melting pot character in mind and discussing how the diversity of the past decades has led to the country we live in today. My California is aset for Grades 4-7, consists of 32 chronological issues, resembling small newspapers that present the story of California in an informal style that is attractive to young readers. California’s history is a rich and turbulent tale, from the explorations of the Spanish seafarers, the Franciscan monks who created the 17-station Mission chain from San Diego to San Francisco, the Gold Rush of the 1850s and on. My Texas also for Grades 4-7, consists of 26 chronological issues, plus three tests, resembling small newspapers and chronicling the important events and people that shaped this vast and powerful “province” of our country. These events are presented in an attractive and informal manner. This set can be used as a complete history curriculum for Grade 4 and for supplemental material for higher grade levels. My Illinois(32 issues) andMy Indiana (30 issues) each provides the same informal and easy-to-assimilate information in the form of small newspapers as the other two sets. News articles describing and discussing the Louisiana Purchase, the Northwest Territory and other major issues of the times are presented in a living and “current” format, just as reading today’s newspaper is. Occupying the crossroads of our country, (but considered part of the West at one time) these two states figured prominently in the political and social developments of the 1800s. The Illinois and Indiana sets are designed for the same age group as the other two sets, Grades 4-7. All five sets are very reasonably priced, and considering the fact that they can used and reviewed for more than one time, the price becomes even more reasonable! Your children’s interest in the development and growth of our country and its territories will be sparked by these excellent materials from Our Land Publications. Please contact Our Land Publications 800.777.5292 for complete outlines of these excellent sets. Or, just visit the website, www.ourlandpublications.com for their free samples, pricing and ordering.